Next Park View Cleanup is This Saturday, January 14th | Park View, D.C.
« MPD Seeks Assistance for Person of Interest in Armed Robbery on Georgia Avenue. 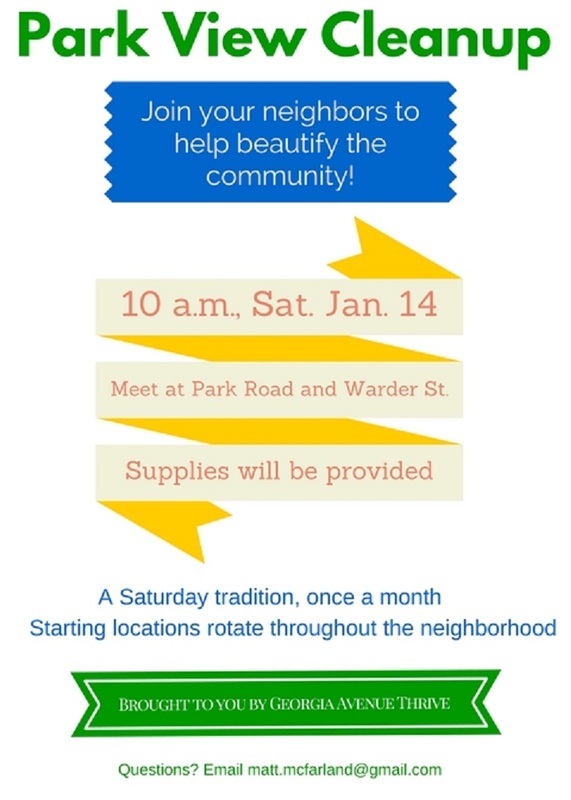 Taking advantage of the forecast temperate weather this Saturday, January 14th, Georgia Avenue Thrive has schedule their monthly community cleanup. This month, they will meet at Warder and Park Road under the beautiful new oak trees. This entry was posted on January 11, 2017 at 7:01 am and is filed under Community Involvement, Volunteerism. You can subscribe via RSS 2.0 feed to this post's comments. Due to inclement weather we’re pushing the cleanup back 24 hours. See you Sunday at 10 am! Same great location.